The title of this meal is really boring and non-creative, but the flavors are anything but! I promise. Maybe someone a little more clever can think of a better title for this recipe, but call it whatever you want because It's delicious. AND it will take less than 30 minutes. Win x2. Isn't that what every modern gal wants - a recipe that is going to take minimal time/effort and packed with loads of flavor. I came up with this flavor combo after we grilled out with friends at the house. We had several leftover sausages that I did not want to waste. As it is with many recipes that I share, my expectations where somewhat low. My husband and I enjoyed it so much I made it again the following week, on purpose this time. I have used several different types of sausage (Italian, English banger, kielbasa etc.) so use whatever flavor you like best. Changing the sausage is a great way to re-use this same recipe/ingredients without it getting old. You can also add in whatever veggies you have on hand or that you prefer. Place sausage and vegetables on large baking sheet with edges. 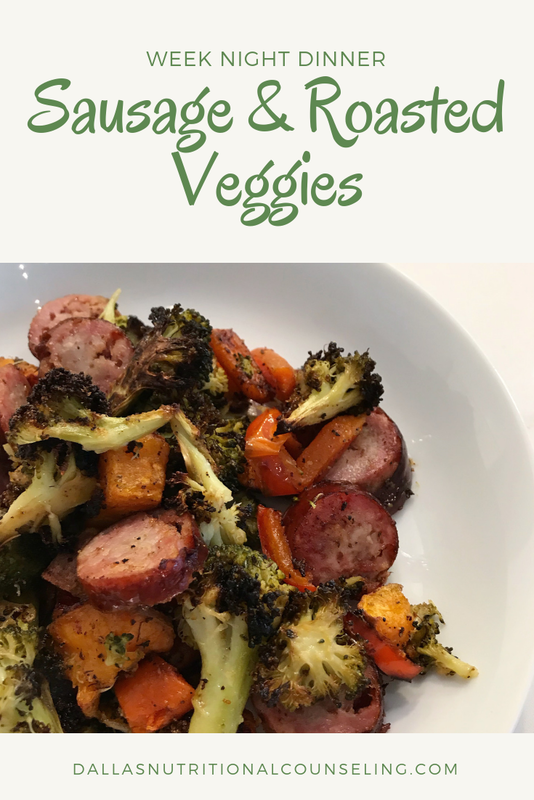 Evenly distripute oil and seasonings across sausage and vegetables. Stir until evenly coated. Place in oven for 20-25 minutes or until sausage is fully cooked through.